…on why progressives shouldn’t get *too* smug about the big swing to the ‘loony right’ on the part of Republicans. He’s right (although he does conveniently gloss over the huge convenient weapon (heheheh) that Clinton handed the Republicans). More education is apparently a bad thing. Lowering taxes will increase revenues only if your economy is to the right of the peak, which most studies place at about 70%. No major developed economies are on that side of the curve. Therefore those Republicans and others on the right who claim that lowering taxes will increase revenue either don’t understand economics or are fibbing. This is surrealist Rene Magritte’s painting, entitled ‘The Treachery of Images’. 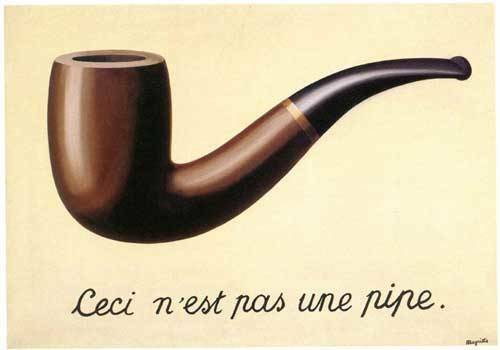 The French text translates to ‘this is not a pipe’. People will say ‘Of course, it’s not a pipe, it’s a painting of a pipe’. And yes, that’s true, and yes, that’s related to what Magritte was about… but it’s just too bald and simple. If the meaning of the art can be got across in a simple declarative sentence, why even bother with the painting? Art works (and I realise I’m beyond armchair amateur in talking about this stuff) by allusion and resonance and by a connection with our experiences and ideas. For example, the title of the painting, which is not painted on it, suggests a slightly different intention. The fact that the image looks very much like an advertisement for a pipe from the era is something else again. Just playing with contradition is also a theme – it reminds me of the old Hitch-hikers Guide to the Galaxy text adventure game, where it was necessary to hack your own brain to allow you to cope with having tea and no tea at the same time. Someone (it’s variously attributed) once said ‘Writing about music is like dancing about architecture’, suggesting that it’s impossible to fully convey the messages of one medium in another. Doesn’t eman writing about music is pointless – I want a connoiseur and critic to point out features of the music I hadn’t noticed, and I love reading about music – but it does mean that reading about the music is never a substitute for listening to it. In the same way, a description or ‘explanation’ of an artwork in simple declarative sentences is never a substitute for engaging with it. Now, the very shallowest level of analysis takes the title ‘The Pot’ as being about marijuana, clued in by the ‘you must have been high’ line. As I tend to say in other contexts, there is no one right answer, but there are wrong answers… and if that’s not one it’s probably close. I’m sure that perhaps that’s one layer of allusion that Tool (a subtle band if ever there was one – except when they’re not) included, but it’s not the focus of the song. The rumour was that the song was about Tool’s singer and songwriter, Maynard James Keenan, and that ‘The Pot’ is a response to that. It’s possible, I guess, that this is one of the things that got Maynard thinking about the notion of hipocrisy, but obviously to explain away ‘The Pot’ as a simple revenge song is to diminish its universal themes. So ‘The Pot’ of the title is the one that calls the kettle black: witness the line about ‘piss all over my black kettle’. Then there are lots of deeper layers of allusion. A ‘kangaroo court’ is an unjust court of self-appointed judges. With these few ideas and reference points, but working broadly with images and ideas and poetry, listening to ‘The Pot’ can be a richer experience. But treating it as Umberto Eco’s ‘open work’ – one that is rich and open to multiple interpretations and reactions, not closed – is a more rewarding experience. I realise that what I like is artwork that is too large for me, that I cannot contain. If I feel there are more meanings there than I can fully grasp and explain, it makes me happy… which is one way of thinking about the distinction between art and not-art (which I otherwise find a fairly tedious one). Here’s to experiencing and engaging with art on its own terms. Blog has been quiet lately – not so much because I’ve been busy (though I have) but because (a) with close to 1500 posts, it sometimes feel as though I’ve said everything already!, (b) there are so many other avenues to share thoughts, from Facebook to Twitter to forums, and many of my friends see things on multiple ones and I don’t want to bore them and (c) a lot of what I’m thinking about these days would be likely to upset or offend various friends – in one direction or another. But the post I’m working on now, for a bit later this morning, is back to the kind of thing I enjoy most: juxtaposing diverse things and thinking about them a bit. There mightn’t be a heap of them, but it *is* nice to still have this blog to share them when they do crop up. A bit odd for an Aussie to be talking about the politics of a US Superbowl ad, but I’m interested in politics and also in semiotics – studying the signs in our culture that communicate meaning. And I wondered – who can we look to in Australia for a positive vision of our nation and its future?